The conditions were predicted to be ideal, and I knew there was a day off coming up. Unfortunately, being Sunday night on Memorial Day weekend, that meant a lot of people were out camping, and Cottonwood was no exception. When I got there, the campsite looked like a small city of RV’s and tents. Even the gate to the second campsite loop was open, and that area was almost full. The sounds of families and groups of friends having a good time, plus a few stereos, filled the background noise. 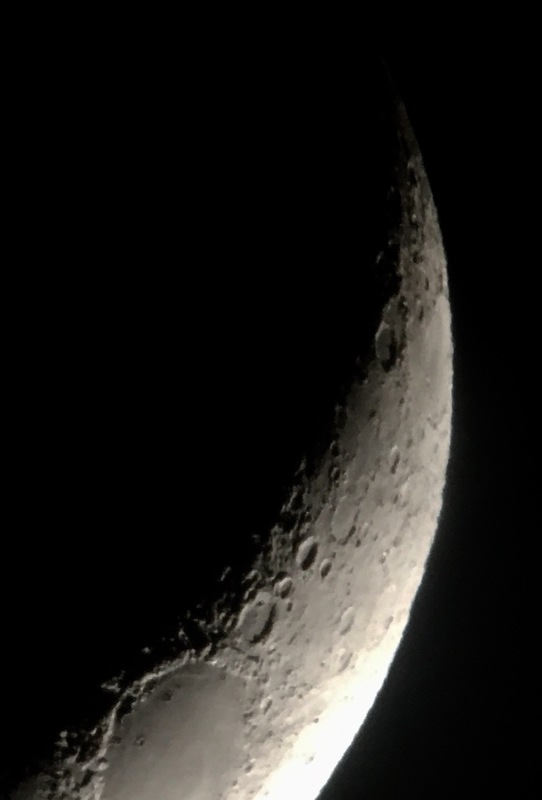 The crescent moon was my first target, and through my telescope I could instantly tell how much sharper the moon looked due to the good conditions. The following pictures do not do it justice. The large crowd meant more people waving around their flashlights as if they were laser swords! As night fell, I could see hikers coming from nearby Mastodon Peak and Cottonwood Spring, and their flashlights from a distance looked like Christmas decorations. RV’s would have their outdoor lights on, and people going on walks around the campsite would wave their lights everywhere but down! There was one child, left unattended, running around the loop shining his light everywhere we went. To make things worse, there was a young couple next to me who were absolutely TERRIBLE with their lights. First, they used the headlights of their car to illuminate their campsite as they were setting up their belongings, even as they had flashlights blaring and a fire burning; why they couldn’t set everything up during twilight hours is up to me. Second, they would NOT turn their white flashlights off while they were sitting around their campsite, and at times they were blaring in my direction. Not even the tall bushes could provide enough refuge from them. Third, as the rest of the campers turned in for the night, these people were STILL up and about, never considering the fact that people around them need the darkness to sleep and/or do astronomy! Thankfully, before I had enough, they did turn everything off and went to sleep, and finally my eyes could adjust to the night sky, and I could attempt to try some long exposure photography, which I am just getting into. While I know that an iPhone with a long exposure app is not the best thing to use, I wanted to simply test it out. Antares and M4 looked great, and even in my small telescope I could see individual stars in the globular cluster. However, as I tried getting a picture of M4, it was very apparent that the iPhone camera does not detect dim light that well. This discouraged me from later trying M13, which is a similar looking globular star cluster. Next I tried NGC 6231 – The Scorpius Jewel Box, one of my favorite targets in Scorpius. Unlike M4, I could clearly see it on my phone screen. But this time, any long exposure shot resulted in star trails even with my clock drive on because my scope was not 100% polar aligned. After that, I tried M7 – The Ptolemy cluster, and got similar results. After that, I tried M8 – The Lagoon Nebula. Even before I took the picture, I could see some hints of red colored nebula on my phone, but because I couldn’t get polar aligned all the way, long exposure wasn’t going to help. So, all in all, despite the people inconsiderate with their white lights, it was a good time figuring out the Night Cap Pro app on my phone. Now I just have to learn how to stack the photos, AND get a tripod to help me take pictures of the sky.